Rev. Kissling was ordained as a pastor of the Lutheran Church–Missouri Synod in 1907. After serving a congregation in Canada he became a “circuit rider” in the Black Hills of South Dakota and in Missouri. Riding from one isolated homestead to another, he ministered to settlers in places where formal churches had not been established. 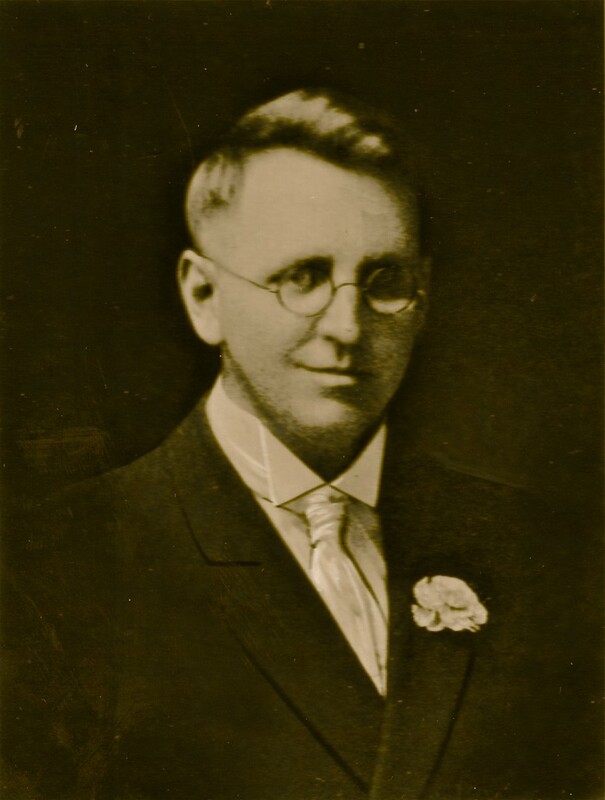 In 1911, he became assistant to the president of the Wisconsin District of the Missouri Synod in Merrill, Wis., and also conducted services in two congregations in Wausau, Wis. In 1914, with his new mission assignment in hand, Rev. Kissling settled his family in a rented house in East Milwaukee (the community was renamed Shorewood in 1917) and started knocking on doors. What he heard must have dampened his enthusiasm. 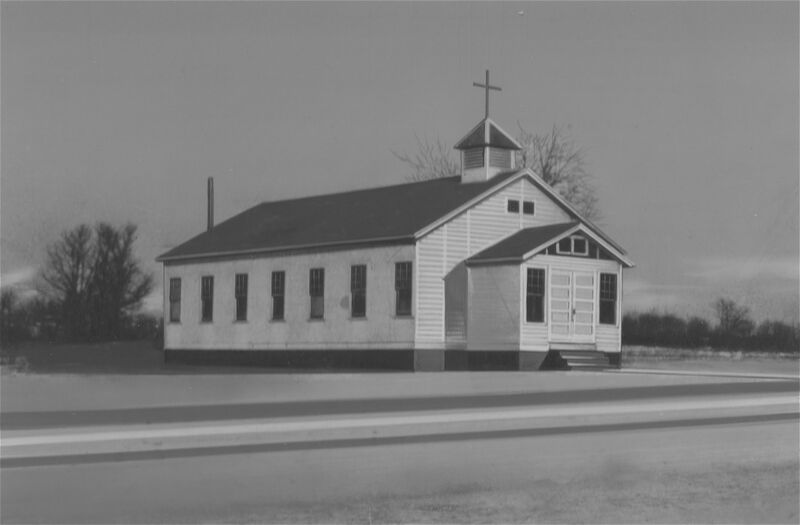 An earlier attempt at establishing a Lutheran church in the community had failed. No one, Rev. Kissling was repeatedly told, wanted to go through that emotionally draining experience again. Possibly, the reverend may have thought, the outlook wasn’t entirely hopeless but a new approach was indicated. Shortly afterward, Rev. Kissling was at their doorsteps again. Children should learn about their faith, he said, and he was starting a Sunday School. Rev. Kissling’s Sunday School met each week in his flat on Newton Avenue – until his landlord objected to the amount of mud the children tracked in. The mission board came to the rescue and rented an empty building on Oakland Avenue. However, shortly after the Sunday school moved in, the building was sold to a new owner. Again the Sunday school moved, this time to a vacant building in the Ravenna amusement park west of Oakland Avenue between Menlo and Newton. 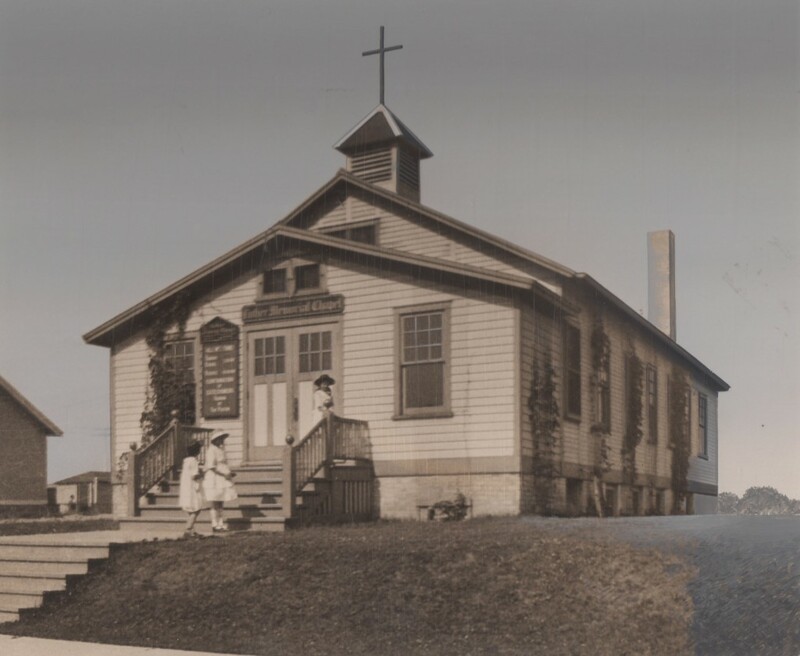 The building, a former restaurant early church members described as “an unheated tumble-down shack,” was unpopular with parents who objected to sending children to such an out-of-the-way place. Pastor Kissling moved the Sunday School back into his house. Early in 1915, Rev. Kissling went door-to-door again. This time he invited people to attend a worship service in the East Milwaukee Village Hall. Although newspapers announced the service and many residents promised to be there, just one person was in attendance when the day arrived. Her name was Mrs. Emma Rische. A member of Trinity Lutheran Church in downtown Milwaukee, she lived near the former Pabst Whitefish Bay Resort. Rev. Kissling’s service was closer to her home. For three Sundays, Pastor Kissling preached to his one-woman congregation. Attendance doubled the fourth week when Mrs. Rische brought her husband, Sam, a Milwaukee architect. Slowly and steadily attendance began to climb. In 1915, Rev. Kissling formed the Choral Club of East Milwaukee. The club sang at his Sunday services, where its members usually outnumbered the worshipers. By 1916, the choir had become a highly regarded institution and was frequently asked to sing Sunday evening concerts at other churches. The singers were usually fed a light supper by the hosting congregation and donations were collected for Shorewood’s future Lutheran church. 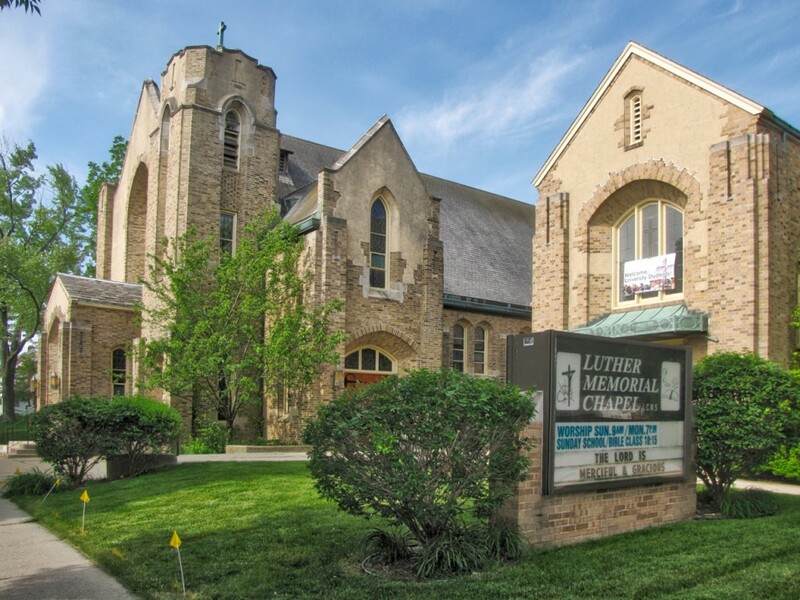 In spring 1916, a constitution was adopted forming the “Evangelical Lutheran Church of East Milwaukee” with 16 charter members. The new congregation was housed in a prefabricated chapel building donated by the mission board. It was placed on Atwater Road (now Capitol Drive) where the Shorewood telephone building now stands. The chapel building soon moved to the site the church currently occupies on Maryland Avenue. Its name also changed to “Luther Memorial,” to mark the 400th anniversary of Martin Luther’s reformation. With the entry of the United States into World War I, there was much grumbling about the practice among many Lutheran churches of conducting services in German. In the Milwaukee Journal’s Sept. 3, 1918, edition, Rev. Kissling tackled the subject head-on. One service, he said, is held in German each Sunday morning at his church. However, the main service, the Sunday School, and Vacation Bible School are conducted in English, as is all formal church business. After noting that members of the Lutheran Church of America subscribed $20 million to the patriotic Liberty Loan drive, of which his own church had contributed an impressive $50,000 (the equivalent of $1.05 million today), Rev. Kissling closed with a brief history of German Lutherans in the United States. Services continued to be held in English and German every Sunday until 1936. By then, a new pastor was leading the church. Rev. Kissling, satisfied the Shorewood congregation was firmly established, accepted a call in 1920 to serve a parish in Shawano, Wis. In summer 1924, excavation began for the present Luther Memorial Chapel. Services and Sunday School were held in the basement of the new church for several months (neo-Gothic in style with some Tudor influences), until the main structure was finished in May 1925. In 1951, a gymnasium and classroom wing was added to the north side of the sanctuary. In 1967, an educational and administrative addition was constructed on the west side of the gymnasium. 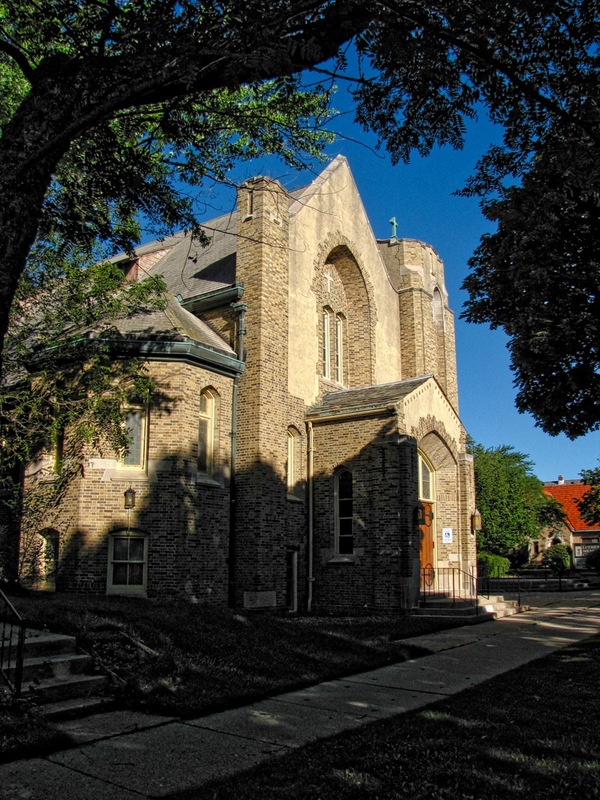 In 2002, the campus ministry at the University of Wisconsin–Milwaukee was transferred to the church and its name was changed to Luther Memorial Chapel and University Student Center. In recent years, the church has added a successful outreach program serving International students attending UW-M.
Rev. Kissling died in 1948. He was then serving as pastor of St. Paul’s Lutheran church at Oconomowoc, Wis., and suffered a heart attack while visiting patients at a tuberculosis sanitarium at Wales, Wis. He was 64 years old at the time of his death, and his ministry had taken him all over the United States, but nothing in his experience matched those Sundays in Shorewood when he preached to a congregation of one. Your pieces on Milwaukee are deeply interesting and beautifully written. I spent the first 35 years of my life there and graduated from UW-Milwaukee. Thank you. Interestingly enough, Rev. Kissling’s wife, Alida Schuricht, was descended from 2 families who had come from Germany in the 1840’s with the group that founded the Lutheran Church Missouri Synod. Five ships left Germany with over 500 Saxons on that perilous journey, but 1 ship was lost at sea. The Schurichts and Tirmensteins were supposed to be on that fateful ship, but their luggage had been put on another, and they were told to switch also. The 5 ships (with 1 foundering) are depicted in the rear stained glass window (right side) of Luther Memorial Chapel. A bit of LCMS (and family) history abides in Luther Memorial Chapel. Do you have an email address so i can update you on the family tree?